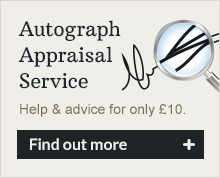 Here we will endeavour to answer the general questions most often asked on the subject of autographs. It is a frightening statistic and very important to remember “experts agree that over 80% of all autographs sold on the internet and in high-street shops are fake”. So if you do not bother to research, educate yourself properly about the memorabilia market or are simply an inexperienced buyer making a hurried or ill-informed decision, there is a strong likelihood that you will buy a non-genuine autograph. You may not discover this until decades later when you or your family are looking to sell your collection (for whatever reason) through a specialist auction or the professional dealer network. What a shock to find out that a once treasured item is worthless and hard earned money has been wasted. I sadly receive phone calls and emails almost every day from people worried about whether they possibly bought fake memorabilia recently or years ago. This material has often been purchased from supposedly bona-fide internet auction sites, from high-street shops and high profile charity fund-raising dinners. Often people can show Certificates (COAs) but when these are researched /checked properly they can prove to be worthless. Just because you have owned it for years. Just because it has a certificate with a fancy hologram. Just because “she was a nice young lady and I had too much to drink that evening”. All will be irrelevant, all will not matter if your item does stand up to proper scrutiny from an expert. Let us not only pontificate on the negatives (as many do) of the autograph world, as the positives far outweigh the negatives. From maybe owning just one autograph of your hero, right through to accumulating a serious collection of hundreds, there can be huge satisfaction, pleasure and the bonus of investment potential in building a portfolio. Whatever your interest might be, can I suggest you now take some time to read all the advice sections below. Without question these will help you make better informed decisions. Without question these may help you to avoid making a potentially expensive mistake in the future.